Even though the Drexel squash program is only two years old, the Dragons finished in the top 25 in both the men’s and women’s rankings following the 2012-13 season. The Drexel Dragons squash teams have not been around long, but they are knocking on the front door of being a top program in the nation. 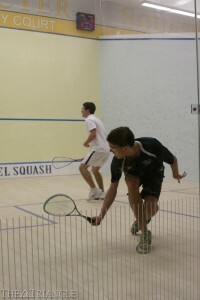 Drexel invited squash to become an official varsity sport in 2011. After two years, the women’s team finished with a ranking of 20th in the nation, and the men’s team finished 22nd. A new program can only be successful if it brings in talent right off the bat. Head coach John White and his staff have done that the past two years, and this year is no different. One of the players White is excited about for the men’s team is Canadian Michael Thompson. White again went out of the country to find the top talent. This time, though, he had to cross the Atlantic Ocean to find Noel Solomon of Sweden. White also found three international players for the women’s team. Mary Fung-A-Fat of Guyana, Maria Diagama of Colombia and Elisa Money of Canada are all expected to make immediate impacts on the team. The men’s team is returning all of its players, which is one of the benefits to having a new program. However, White could not put the nail on the head for top returners for this team and gave the impression that competition for the top spot is wide open. “All players that return fit and ready to play are key returners,” White said. The women’s team is riding in the same boat as the men’s team. Both Dragon teams had their fair shares of ups and downs. For instance, the men’s team had some close losses that haunted them later in the season. The women’s team vastly enhanced its performance from a season ago, and the College Squash Association took notice. The women’s team finished in the top 20 and was named the most improved team for the 2012-13 season. The Drexel squash teams are looking to have a bright future ahead of them. By picking top talent from around the world, the coaching staff shows how much potential it sees in these teams. “I’m very excited for the season to get underway, as we are bringing in some great recruits on both teams that will help strengthen the teams and give us the chance to get inside the top 16,” White said about his programs. Even though it is the offseason, the coaches and players never stop improving on and off the court. On the coaching side, White and his staff want to work on reaching out to potential future Dragons and keeping Drexel graduates in the loop. As for the players, they know now what is expected of them if they want to break into the top 20. “I would like to work on the team’s fitness and match play, but this is up to them [until] the start of the season. … Then the fun starts!” White said with a smirk. The women’s and men’s teams will look to keep improving into the 2013-14 season. If the recruits live up to their potential and the players improve in the offseason, we could see both teams making a run for a top-16 ranking.